February 2011 - Contemporary Controls' BAS Portable Router has been recommended as a replacement for Alerton's BACtalk FST-100, a portable network connection tool that was designed to improve the efficiency of field service technicians performing point-to-point checkout. The FST-100 helped expedite the time it took for users to connect to a BACtalk system and perform troubleshooting tasks. The BACtalk FST-100 is no longer available, but Alerton recommends the Contemporary Controls BAS Portable Router as a replacement. Like the BACtalk FST-100, the BAS Portable Router allows the user to route messages between BACnet/IP and BACnet MS/TP networks. It is intended for commissioning and troubleshooting without making a permanent connection. The BAS Portable Router is much smaller and lighter than the FST-100. It receives power from a USB cable attached to a laptop computer and does not utilize a battery pack like the FST-100. "The BAS Portable Router is one of our most popular products," said Joe Stasiek, Sales Manager of Contemporary Controls. "It's an excellent replacement for the FST-100. We have a long history with Alerton and we're pleased that they are recommending the BAS Portable Router." 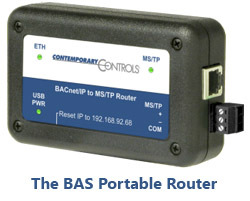 The BAS Portable Router allows BACnet/IP commissioning software connected over Ethernet to communicate with BACnet MS/TP field devices. For portability, the BASRTP-B attaches to the USB port of any laptop computer in order to extract power but communication is over Ethernet. Each unit contains one MS/TP port and one 10/100 Mbps Ethernet port. The router is configurable via its webpage. The BAS Portable Router's MS/TP port can connect up to 63 Alerton controllers. The MS/TP port offers an optically-isolated transceiver. It has a removable 3-pin terminal block for the EIA-485 connection. All MS/TP baud rates are supported from 9.6 to 76.8 kbps. The Ethernet port offers a shielded RJ-45 connector. Through Auto-Negotiation and Auto-MDIX, it automatically matches its duplex setting, data rate and signal polarity to whatever is needed by the attached equipment. Therefore, any CAT5 cable can be used for hookup. A resident web server allows commissioning, re-configuration and troubleshooting with a standard web browser. A reset switch is provided on the router to set the unit to the factory default IP address. Three LEDs are provided: The power LED glows green when proper power is provided. A bi-color Ethernet LED glows green for 100 Mbps operation and yellow for 10 Mbps and indicates activity by flashing. A green LED flashes when MS/TP traffic is received. Visit the BAS Portable Router product page to learn more. When is an Ethernet Hub Better than an Ethernet Switch?